“A hula expert had said that she had seen the stone of Makapuu with her own eyes and it layed close to the point that bears her name. It was a real stone and on the head were lumps of black stone like the haole’s coal. They resembled human eyes.” Although the name Makapu’u still remains, the Makapu’u stone disappeared many years ago. 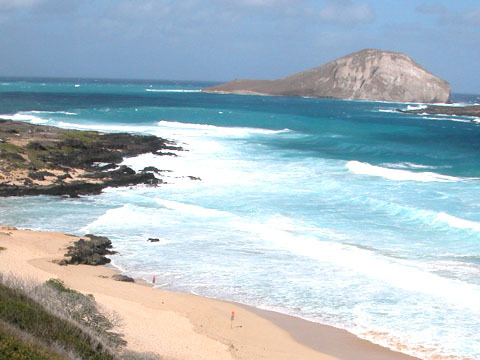 Makapu’u Beach in the lee of the point is one of the most famous bodysurfing beaches in Hawai’i. When the coastal road between Sandy Beach and Waimanalo was completed in the 1930s, beachgoers from all over O’ahu began finding their way to Makapu’u to ride its waves. The Waikiki Surf Club held the first bodysurfing contest on August 16, 1953. Makapu’u became such a popular bodysurfing beach that board surfing was prohibited by regulation of the State Department of Transportation. Bodyboards and paipo boards are permitted, but only if they are less than three feet long and have no bottom fin. Makapu’u Beach, a pocket of sand about l,000 feet long, is bordered by the high sea cliffs of Makapu’u Point and a point of lava rock that houses its showers and restrooms. Seasonal high surf causes dramatic changes in the width of the beach. During the summer the beach is wide and the ocean is usually calm. During the winter high surf erodes the beach, exposing large rocks in the pounding shorebreak, and generates powerful rip currents. Lifeguards make many rescues here every year.